Born into an East Boston immigrant family fallen onto hard times, Richard Schultes was the first of his family to go to University. 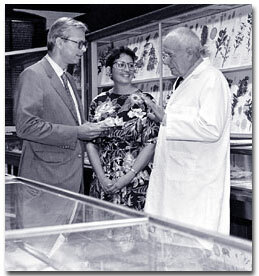 As a student at Harvard, he came under the influence of Oakes Ames, the distinguished orchidologist and director of the Harvard Botanical Museum. In Ames’s class on Plants and Human Affairs, the young Schultes came to study peyote (Lophophora spp. ), fascinated by stories of hallucinogenic effects. A small cactus from New Mexico, this plant had at that time spread to almost 80 tribes in the USA, who used it as a medicine and ritual sacrament. As part of his studies, Schultes spent six weeks in 1936 living among the Kiowa in the midwest. He was, in Wade Davis’s words, “one of the last generation scholars to actually know the Kiowa men and women who had lived the culture of the Plains.” Taking peyote with the Kiowa, attending their night-long ceremonies and sweat lodges, Schultes listened to the stories of the Kiowa and came to understand the place of peyote in their lives. His career as an ethnobotanist had begun. His next quest was the long-lost identity of teonanacatl and ololiuqui, the most revered hallucinogenic plants of the Aztecs. An American botanist had argued that teonanacatl was simply the Aztec name for peyote, and not the sacred mushroom reported by the Spaniards. Schultes traveled to Oaxaca, Mexico, to find it. Soon he and his companion, local botanist Blas Pable Reko, located a group of Mazatec people who used the mushroom in nocturnal ceremonies, where native healers invoked the medicinal power of mushroom through prayer. They called the mushroom “the little holy ones.” Schultes was not the first to attend a teonanacatl ceremony, but he was the first botanist to collect and identify the mushrooms, now known as Panaeolus sphinctrinus. This extraordinary discovery led to the birth of the psychedelic era, and the term (not coined by Schultes) “magic mushrooms.” A year later, Schultes was able to identify the even more sacred and potent ololiuqui as the morning glory Turbina corymbosa. It was later found to contain chemicals very close to LSD. Young Richard Schultes taking tobacco snuff, May 1952. Photo by R.E. Schultes. 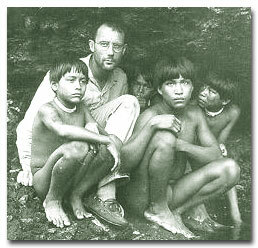 As World War II started, Schultes returned to Harvard and accepted a fellowship to study arrow poisons in the NW Amazon, which was to be the area of his greatest travels. He arrived in Colombia in 1941, where on his first day, on the outskirts of Bogotá, he discovered a new species of orchid no more than an inch high. He pressed it in his passport and sent it to Oakes Ames, who named it Pachyphyllum schultesii, the first of many plants named in Schultes’ honour. From 1941 to 1953 Schultes traveled extensively in the Colombian Amazon, a land he termed Where the Gods Reign, the title of a book of photographs from the region. In these years, he collected over 24,000 specimens and made numerous ethnobotanical discoveries. A particular interest was the source of the arrow and dart poisons know as curare. Finding a reliable source of supply was vital to Western medicine, where it is a muscle relaxant used in surgery. Schultes was the first to reveal how psychoactive and toxic plants touched every aspect of the lives of people like the Kofán. He was also the first to appreciate the astonishing range of plants used by indigenous peoples of the Amazon basin and how hallucinogenic plants were at the heart of their sacred rituals and medical practice. As Davis remarks, the Kofán indians are ‘the masters, the patrons of ecstatic intoxication’. Enduring the dangers of rapids, bouts of disease such as malaria and beri-beri, loss of equipment and plant materials, Schultes stayed as long as 14 months in the forest without a break, mainly traveling by canoe along the rivers. Once, sick and ill, he had to paddle for 40 days to Manaus to seek medical help. Another time, he had to wait at a remote airstrip for two months for a flight out. With no contact to the outside world, life in perhaps the remotest tropical area on earth was harsh and unpredictable. Schultes was driven by his passion for plants, his appreciation of the way of life of the indigenous people and his fascination about how the plants were used. Dr. R.E. Schultes and Macuna boys in the 1940s, Rio Apaporis. Photo by R.E. Schultes. During the war years, the US Department of Agriculture assigned Schultes to work on natural rubber. In the early years of the 20th Century, there was a booming trade in rubber collected from wild trees in the Amazon, a trade soon to be replaced almost entirely by rubber from plantations in Asia. With Asia overrun by the Japanese, the Americans and their allies were desperate for rubber. Schultes was sent to search for wild rubber trees in the NW Amazon. He made a grueling series of journeys along the 1000 miles of the Apaporis River, counting every rubber tree from the river. He estimated, that within 1000 yards of the river bank, there were 1.5 million rubber trees. Yet at densities of only one or so per acre, it was impractical to exploit and would never be enough. In the end, America survived with a massive nationwide recycling program and the development of artificial rubber. Later on, Schultes led a search for strains of wild rubber resistant to the lethal South American leaf blight, with a view to establishing plantations of natural rubber in the American hemisphere. His collections enabled extensive trials to be established in Costa Rica, but tragically the US Government abandoned the effort, and much of the work was wasted. After 1953, the focus of Schultes’s work returned to Harvard. He devoted much of his time to his students. With chemist Alfred Hofman, he wrote the leading book on hallucinogenic plants and published a volume of his evocative black-and-white pictures from his travels. He continued to visit Colombia, where he helped establish vast national parks in the Amazon. He was awarded Colombia’s highest honor as well as WWF’s Gold Medal. 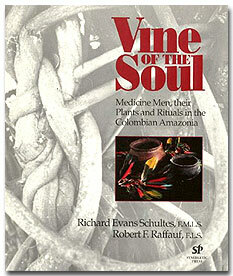 Richard Schultes was the father of modern ethnobotany, the study of the use of plants by native cultures such as the Amazonian Indians, among whom he lived in the 1940s. He was also the leading authority on peyote, ayahuasca and other hallucinogenic plants, and his research came to influence William Burroughs, Aldous Huxley and the drug culture of the 1960s. 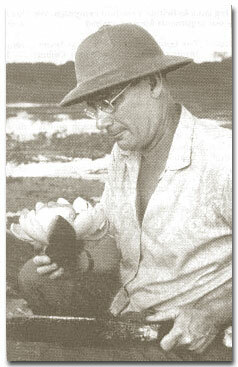 He documented the use by them of more then 2,000 medicinal plants, and gathered some 24,000 specimens. He also gave his name to 120 species, as well as to 2.2 million acres of rain forest protected by the Colombian government. 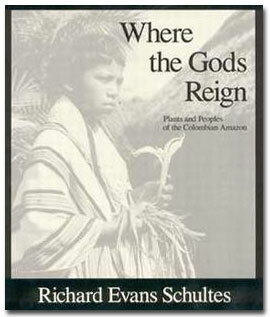 Schultes was among the first to chart the growing threat to the eco-culture of the Amazon. Richard Evans Schultes was born in Boston on January 12, 1915, the son of an engineer who put plumbing in breweries. He was educated at East Boston High School and then won a scholarship to Harvard, where he soon switched from medicine to botany. Making the peyote cactus the subject of his dissertation, Schultes spent a month with the Kiowa Indians of Oklahoma, who used the sacred cactus ceremonially to commune with their ancestors. 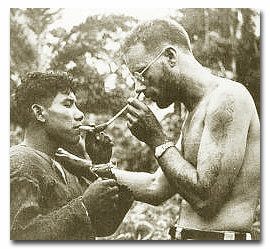 In 1941, Schultes traveled to the Colombian Amazon to investigate the source of curare, which as well as being poison had also been used in hospitals since the 1930s as a muscle relaxant. He discovered that different types of curare called for as many as 15 ingredients, and in time he helped to identify more than 70 species that produced the drug. During the Second World War, Schultes searched the Amazon for alternative sources of rubber to the Malayan plantations occupied by the Japanese. He taught Indians how to tap latex, and became an expert on the genus Heva, the principal species of rubber tree. With the return of peace, he once more took to his canoe, and for a dozen years lived in the rain forest. Sometimes surviving for days on end on tins of condensed milk, he fended off bouts of malaria and beri-beri, once having to paddle for 40 days while ill to reach help. On his travels he collected thousands of samples, many of which were regularly used by shamans to successfully treat illness. He had a rather quirky sense of humor, sometimes demonstrating his proficiency with a six foot blowpipe in lectures, and refusing to vote for American presidential candidates, replacing their name on the ballot with that of the Queen. Schultes published nine books, including Plants of the Gods (1979), written with Albert Hofmann, the chemist who synthesized LSD. He received the Gold Medal of the Linnaean Society in 1992. — From The Daily Telegraph of the United Kingdom.